Supports students in identifying their inner and outer strengths and resources so they can be safe, healthy, happy, and successful. Each of these 50-minute Kaleidoscope Lessons supports students in identifying their inner and outer strengths and resources so they can be safe, healthy, happy, and successful. What will the Kaleidoscope Lessons do? Kaleidoscope Lessons will help students find and strengthen their connections with “Anchors” — the name for any adult who can offer them support — who take an interest in them, who bring out their talents, and who connect with them. By establishing several of these supportive relationships, youth are more likely to succeed. What can I expect when I lead these lessons? Students gain a better knowledge of themselves — who they are, what they should strive for, what they should avoid, and who can support them. Students form and sustain supportive connections with adults and self-activate their strengths and natural abilities. Students enjoy learning about the developmental ecology that surrounds them, themselves, each other, and their community. Educators feel good about teaching young people meaningful, measurable, and memorable things about their lives. COMING SOON: Prism Lessons for grades K-6. 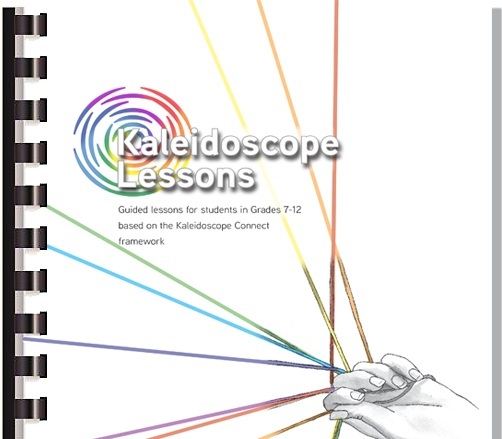 Learn more about Kaleidoscope Lessons.